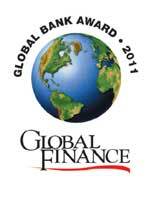 NEW YORK, August 22, 2011 – Global Finance magazine (GFmag.com) has announced its World’s Best Banks 2011 Awards. The annual listing includes the best bank worldwide for corporate, consumer and private banking, emerging markets, islamic finance, asset management, global custody, investment banking, cash management, trade finance, foreign exchange and sub-custody. The winner of Best Bank for Foreign Exchange was announced in the January 2011 issue, Best Bank for Cash Management was announced in the March 2011 issue and the Best Bank for Investment Banking was announced in the June 2011 issue. The World’s Best Banks report will be featured in the magazine’s October issue and will have extra distribution at the Annual Meetings of the World Bank and IMF in Washington. Winners were selected based on performance over the past year and other subjective criteria including reputation and management excellence. Global Finance made the selections after extensive consultations with bankers, corporate financial executives and analysts throughout the world. The World’s Best Banks and other Global Finance 2011 award winners will be honored at an Awards Ceremony at the National Press Club, Washington on September 26.